The son of composer Alexander Serov. Studied with I. E. Repin (in Paris and in Moscow) and at the St. Petersburg Academy of arts (1880), One of the leaders of the Association "World of art". Was friends with M. A. Vrubel and K. A. Korovin. A brilliant master of psychological portrait. Even in custom, parade portraits brilliantly passed the nature of nature. Special sincerity of the artist appears in the portraits of children, in which the artist strove to emphasize the immediacy, spiritual purity and clarity of perception of the child. In the end of life creates several masterpieces. Valentin Serov was born in St. Petersburg on 7 January 1865 (old style) in the family of the famous composer Alexander Serov. Since childhood, the future artist was surrounded by the atmosphere of art. In addition to the musicians in their house was visited by Antokolsky, Repin. In addition, he is the father of the future artist was a passionate lover of painting. Rare observation and ability to draw the boy woke up early, and the conditions in which he grew up, favored the development of talent. First he studied at the German artist-etcher A. Camping, then became his teacher, I. E. Repin, who, on the advice of M. M. Antokolsky, V. S. Serov showed pictures of his son. I. E. Repin begins to engage with young Serov, first in Paris and then in Moscow and in Abramtsevo. After a trip with his talented pupil in Zaporozhye Repin in 1880 sends it to the Academy of arts to the famed p.p. Chistyakov. Here the young artist wins respect, his talent is admired. P. p. Chistyakov said on Serov, that he has not seen in the other person such measures comprehensive artistic attainments in art, which was released by the nature of his pupil. "And the figure and color and light and shade, and character, and a sense of wholeness of his task, and composition were Serov, and was in a superlative degree". Friends of the artist, his contemporaries noted precious human qualities of his nature, rare integrity and honesty. 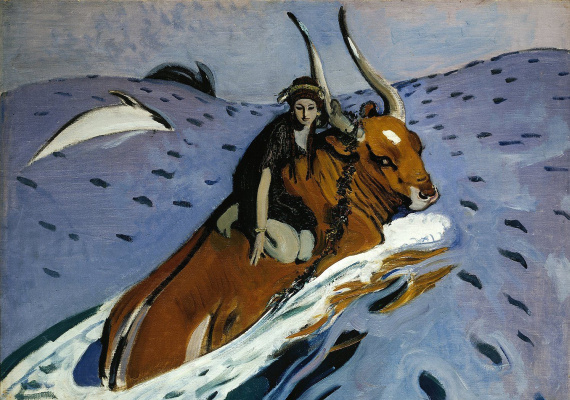 Of great importance in formation of artistic views they may have life, Serov in Abramtsevo and Domotkanovo. Central Russian nature, with trees, lawns, ravines, copses, with vicinities Russian villages fond of the artist since childhood, and the house Mamontov, where on sketches of scenery worked Korovin and Vrubel, where there was a workshop of majolica, where was a success in the private Opera, inspired the artist to a happy creative success. At the age of twenty-two, twenty-three years Serov creating works that became a classic in Russian art. In Abramtsevo he writes the famous portrait of twelve Faith Mammoth "the Girl with peaches" (1887, state Tretyakov gallery), in which the artist, as he writes, wanted to preserve the freshness of painting in full completeness, as the old masters". 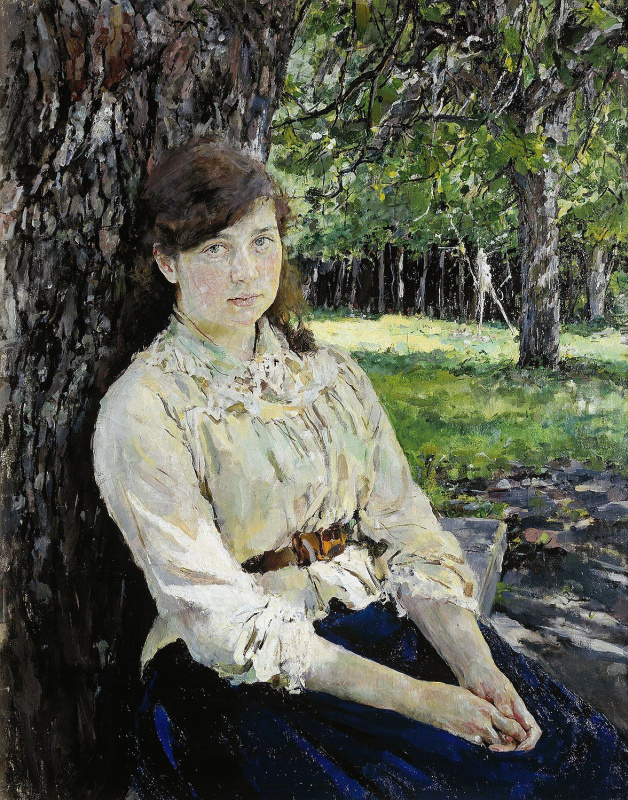 In Domotkanovo was created portrait cousin "Girl, illuminated by the sun" (1888, state Tretyakov gallery). Recalling the time, Maria Yakovlevna the Simanovich wrote: "We are working avidly, both equally carried away: he’s a good Scripture, and I the importance of their purpose. He was looking for a new way to transfer to the canvas infinitely diverse play of light and shadow when the freshness of colors. Yes, I spent three months, and almost without a break, except for some of those sessions that had to be postponed due to bad weather. In these unfortunate omissions he wrote pond" ("the Overgrown pond. Domotkanovo", 1888, state Tretyakov gallery). Both portraits filled not only by the enthusiasm of a new painting technique, but also special spirituality, poetry, that immediately identified the young artist and made it known. 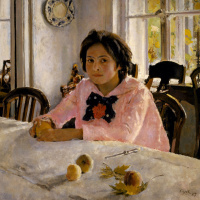 For the painting "Girl with peaches" Serov received the prize of the Moscow society of art lovers, and the second portrait immediately bought Tretyakov. In your favorite Domotkanovo were created such works as "October" (1895, GTG), "Strigoi" (1898, state Tretyakov gallery), "Baba with a horse" (1898, state Tretyakov gallery) and many drawings to Krylov’s fables. In 1887 Serov married Olga Fedorovna Trubnikova. The family was big and friendly. Children Valentin tenderly loved and enjoyed writing them. Portrait painting of "the Children" (1899, RM), which shows the sons of the artist Yura and Sasha, the figure "Sisters such prominant Russian Industrialists" (1900, state Tretyakov gallery), portrait Mika Morozov (1901, state Tretyakov gallery) attract lyricism and fine comprehension of the child’s character. His friend Mamontov Serov reported in 1890: "I have Written in Kostroma two portraits. Quite portretom become". Subtle psychology, ability to see and to show, "of which the spirit of man before him, do Serov leading portrait painter of Russia. 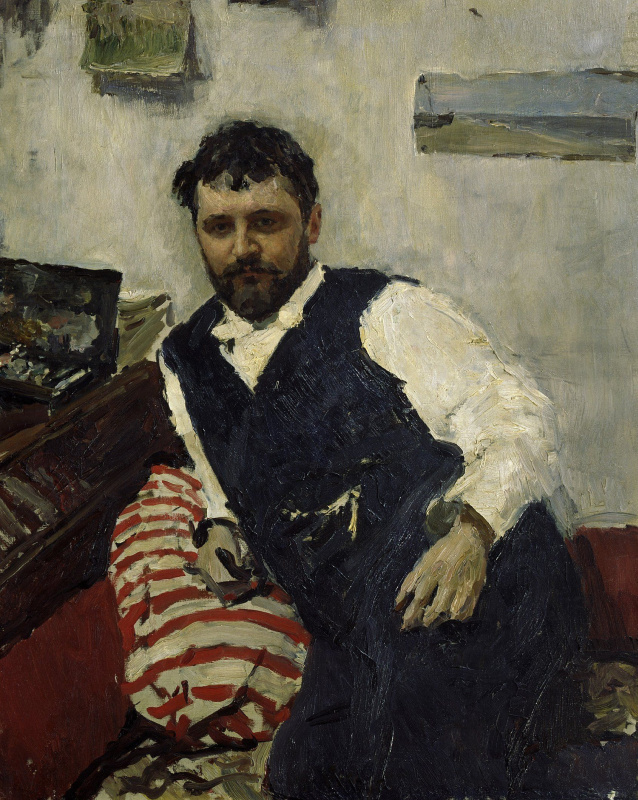 In Serov’s portraits of his contemporaries, different in character, inner peace: temperamental singer F. Tamagno (1891, state Tretyakov gallery), which has, according to the figurative expression of the artist, the "Golden throat", cheerful each landscape artist K. A. Korovin (1893, state Tretyakov gallery), inspired Levitan (1893, TG), and highly nervous Leskov (1894, state Tretyakov gallery). The eldest daughter of Serov in the memories of my father wrote, with some creative burning the artist worked on portraits. "But the eyes glancing quickly, with such a tension, with the desire to see and to cover all needed him that seemed particle lightning, lightning, he instantly as if illuminated everything down to the smallest detail". In the mid 90-ies Serov precipitated senior customers. 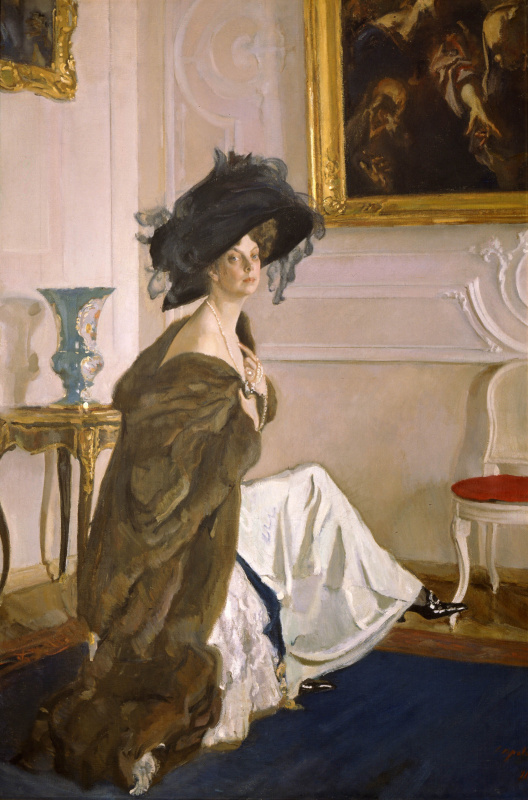 After writing the portrait of Maria Feodorovna Morozova (1897, the state Russian Museum), the mother of armellino Morozovs, and painting-portrait of S. M. bukinoy (1899, RM), shown at the Paris world exhibition, started a new line in the artist. Contemporaries said that Serova often afraid, afraid of perspicacity, incorruptible estimates, even reproached that it chargerait model. "Never argirova, " said he, " what if cartoon sits in the model than I to blame? I only spotted, has noticed". In the portraits Serov — not parse negative or positive properties of a person, and caustic irony or wit, expressed in brilliant aesthetic form. 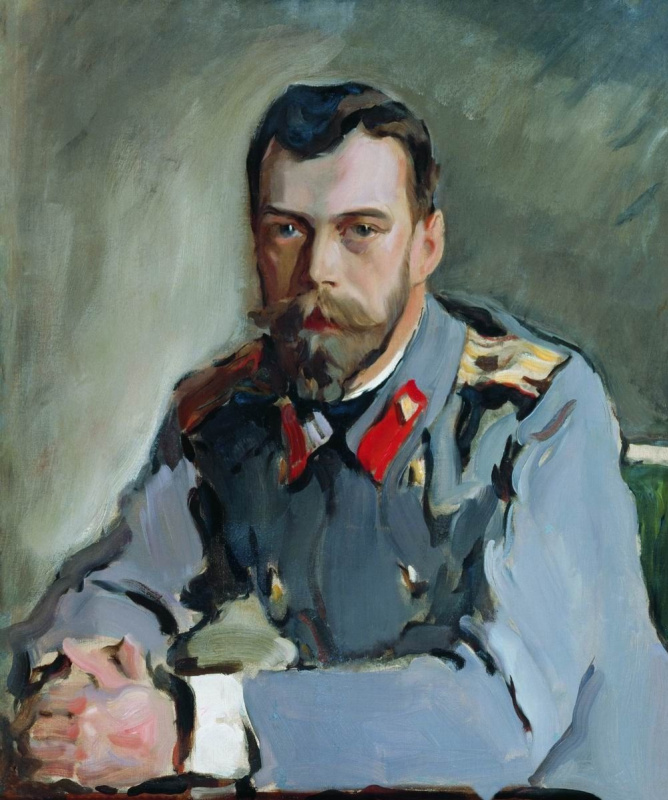 These features differ portraits of princes Yusupovs (1901−1903, RM), which Serov began to write in St. Petersburg in 1901 and continued their family estate Arkhangelskoye near Moscow, portrait of a Privat-docent of the Moscow University, millionaire M. A. Morozova (1902, state Tretyakov gallery). Especially well-known portrait of a banker C. O. of Hirschman (1911, state Tretyakov gallery), which, according to her daughter Serov, "all begged him to remove his hand, which he kind of got gold from his pocket". 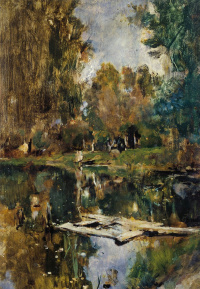 Serov did not intend to rebuke, he only focused on those features that were sometimes buried in nature and is not visible to everyone. When man was pleasing to him, but it was an official order, under the brush of the master appeared attractive image: for example, 3. Century Yusupova (1902, RM) charming femininity and softness, G. L. Girshman (1907, TG) is distinguished aristocratic subtlety. Artistic skill, perfection of the picture Serov unusually high. Weight emotional impact of the artist’s works is explained by the ability to find the exact means and in perfect form to embody a multifaceted picture of life. The portrait of the Century A. Serov "Portrait of Portrety"as jokingly called this genre of the artist is not simply a talented recreation damn individuals, but — and the world in which he lives depicted people. Revolution of 1905 has left an appreciable trace in the creative heritage of the artist’s life. It was in these years was formed look Serov-citizen, acutely aware of social injustice. In St. Petersburg Serov was an eyewitness to the shooting of the workers on the 5th line of Vasilievsky island, and it shook him… "He heard the shots, saw the dead. 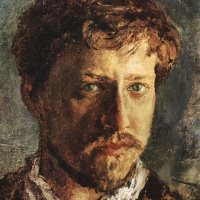 Since then, his character has changed dramatically — it became sullen, rude, violent and intolerant: especially surprised everyone with his extreme political views," - wrote about Serov, Repin. In protest, he went out of the full members of the Academy of arts. On the day of liberation of political prisoners Serov was at Taganka prison, was in University, where he built barricades, and at the funeral Bauman. 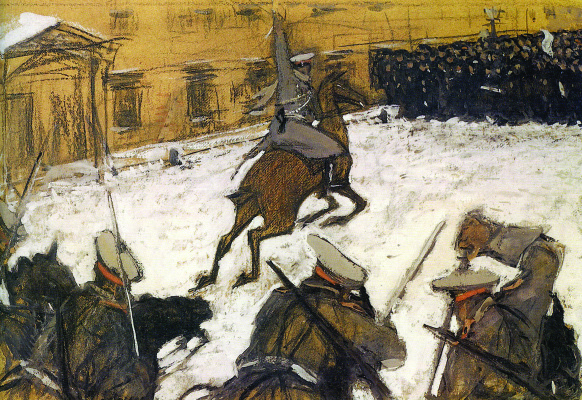 In the album artist appeared drawings: attacks of Cossacks on unarmed people, and then the painting, executed in tempera, "Soldatushki, Brava ourselves, where is your glory?" (1905, state Russian Museum), "the Barricades, the funeral N. E. Bauman" (1905, GOS. the Museum of the Revolution of the USSR), the acute political cartoons that were exposed Nicholas II as the executioner of the revolution: "the year 1905. After the suppression", "the year 1905. The harvest of 1906" (1905, state Tretyakov gallery). During these years more honed skills Serov-painter. Portraits-paintings Chaliapin, K. S. Stanislavsky, I. M. Moskvina, V. I. Kachalov, Rimsky-Korsakov, M. A. Vrubel, Andreeva are the pride of Russian art. At the turn of the 1890−1900 years, the artist turns to the past of Russian history. There is a cycle of pencil drawings, gouache, watercolours, tempera paintings, oil. The small compositions seem strangely life, if written from nature ("the hunting of Peter II and Empress Elizabeth", 1900, state Russian Museum). The heroic epoch of Peter I, the severe and unprecedented, captivated the imagination of the artist. One of the best tracks — tempera "Peter I" (1907, state Tretyakov gallery). Peter crane legs, terrible and sudden moves towards a strong wind. Its ridiculous carnival Suite (so unusual forms accept them fluttering in the wind service) hardly moving for him. In a swift step Peter towards a new construction, in the boiling water in a thin masts of ships, rushing in the clouds — in the whole sense of the dynamics of transformations that were made possible by the power of will, energy, vortex onslaught of courageous people. In may 1907 Serov goes to Greece, which made a huge impression on him. In ancient classics artist I admire decorative monuments, their proportionality. He strives to embody what they saw and convey the essence of the legendary history, the beauty of the mythology of Greece. The artist also creates a poetic legend "Abduction of Europe" (1910, TG) and different variants of the "Odyssey and Nausicaa" (1910, the state Tretyakov gallery, state Russian Museum). Not less interesting work Century A. Serov in house. It curtain for the ballet "Scheherazade" had a great success in Paris and in London. 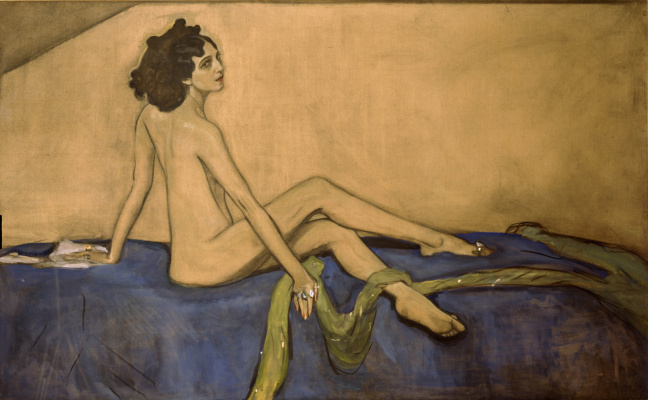 Interest in monumental and decorative art was caused by a special decision of the portrait of a dancer IDA Rubinstein (1910, RM). 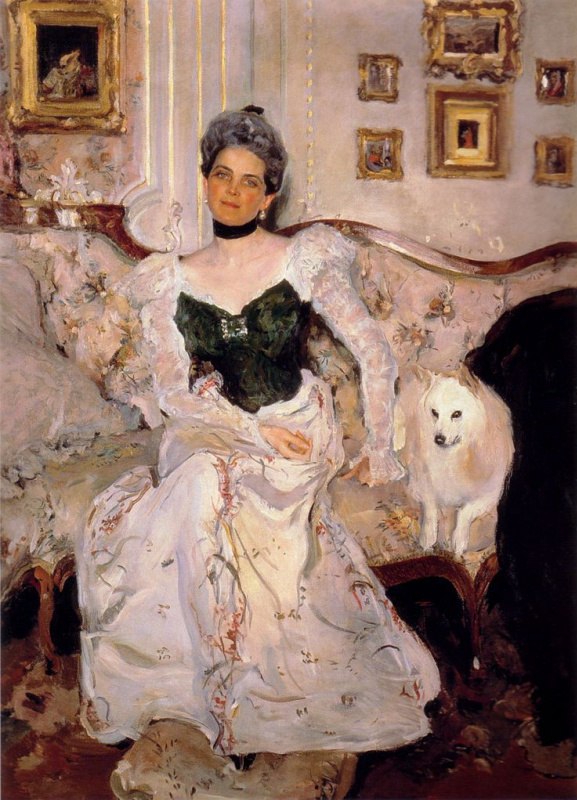 Serov found in the form actress features authentic East and compare it with the figures of the ancient bas-reliefs. In the portraits of the last years — O. K. Orlova (1911, Russian Museum), C. O. of Hirschman (1911, Russian Museum) — artist strives to acute expression of the form. This is particularly noticeable in the portrait, L. Girshman (1911, state Tretyakov gallery) and in the unfinished portrait of P. I. of Scherbatova. The death of the artist has shocked his contemporaries. Worshipping the talent of the master poet Bruce wrote: "Serov was a realist in the best meaning of this word. He saw the unmistakable secret truth of life, and what he wrote, reveals the very essence of phenomena that other eyes see not know how." Soldiers, Bravo lads, where is your glory?